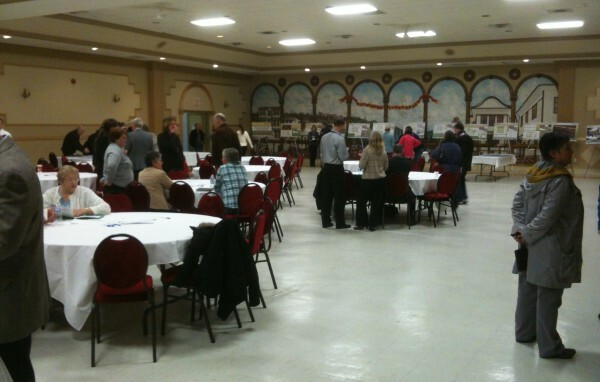 A public information open house was held for the Windsor-Essex Parkway today at the Macedonian Community Centre on Howard Avenue. Plans for the next six months of progress on the Parkway were announced which include placing stockpiles of dirt and other resources, pile driving operations and detours along Huron Church. Construction crews are preparing to begin digging five of the Parkway’s tunnels this December. Plans state that at least four lanes of traffic (two in each direction) along Huron Church will be maintained during tunnel construction. Reductions to one lane in each direction may be required during late night hours. Traffic diversions through the areas of tunnel construction will be in effect over the next six months. Access to all areas — including residential areas west of Huron Church — will be maintained throughout construction by way of diversions. Officials are proposing a closure of the EC Row Expressway ramp at Matchette road to permit installation of drains for the parkway. Parkway engineers state “consultation on this proposed closure is ongoing”. Noisy pile driving operations will also be starting in December in areas where tunnel and bridge construction will take place. Pile driving will be limited to daytime hours to reduce noise. The Windsor-Essex Mobility Group, responsible for liaison functions between the Parkway and the public state that “we want to work as quickly as possible to complete construction so that residents and travellers can start realizing the Parkway’s many benefits”.